We’ve added new holiday design elements in Designer Plus to help you create stylish products for your clients during the busy season. Be sure to check for the update and select “Scrapbook” to receive the latest additions. In the example below, we are creating a Flat Card with some of the new releases. When you open your project, add photos by clicking the “+” symbol in the upper left-hand corner of the software. With this Flat Card, we’ve decided to add the B6-Holly option located under Scrapbook at the bottom of the screen. Simply drag and drop the art to the desired location in your project. You can also add photo nodes to your project by clicking the “Add Picture Box” button located next to the “Save” icon. Here you can see that we’ve added two additional photos to the back of the Card. For the front of the Card, we dropped in the BeMerry1Wh art from the Scrapbook and used the Text tool to add a simple greeting. Find more excellent options for the holiday season in Designer Plus and stay tuned for other exciting announcements in the coming weeks. I am so excited that you have added these overlays! I hope you are also adding senior overlays. Hi Karen, we will definitely revisit senior overlays as we get closer to graduation season. Thanks! Looking forward to trying these this year! Is there a way to access these overlays in ROES? 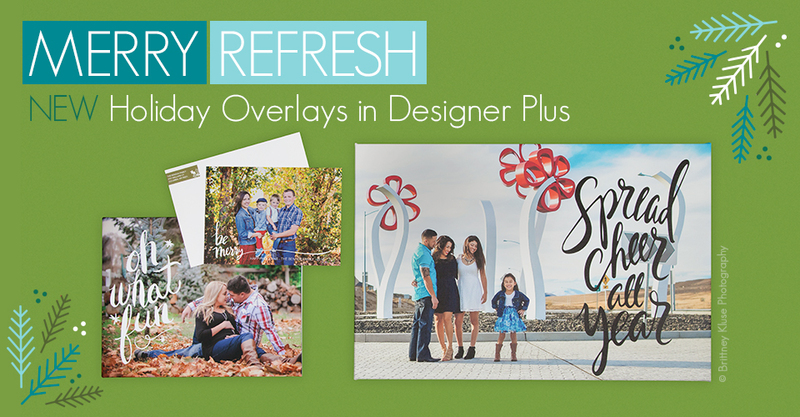 Hi Denise, these overlays can only be found in Designer Plus just in Designer Plus. I LOVE that you did this! Thank you! It will be so helpful for card making for clients!!! You guys rock! OH MY GOODNESS!! I’m SO excited to add these to my already-amazing list of products to offer to my clients! I can’t wait to start using these! I’m going to add an album of “Holiday Cards” to my Zenfolio website, just to sell these with my non-portrait images! This looks really cool! Where is Designer plus sold? I followed your instructions and can’t find all of the options under scrapbook that you show in your images. Hi Denise, make sure you update Designer Plus and you should see the new overlays. If that doesn’t do the trick, contact customer service and we will help you out! Adds just the right amount of pizazz, making an already special card even more fab.